For the last three months I have been following the P90X routine. I was encouraged to try P90X by a friend but I waited until the summer hockey season was over before devoting waking up early to work out. Over the years I have had a fairly steady exercise routine but recently it has been streaky. Prior to starting at TELUS my mornings exercises were peaceful and not rushed, but with my commute to TELUS relying on buses I have a schedule to keep. I was hitting a plateau and in a rut with what I was doing but I continued anyway. In May my routine went out the window with our trip to Iceland. When we came back in June I kept saying “I’ll start tomorrow” and then hockey season began and late nights followed by early mornings didn’t mix so the amount I worked out nose dived. Enter P90X in September and three months of 5AM wake ups, exercising on the weekend and following a program that beat me down every day. At first the non weight days, the ones with Plymoetrics, Yoga and Kenpo were strange and foreign; but after a hard day of weights I looked forward to “taking it easy” as I used my body to punch, kick, jump and stretch. The results of all of this? I think it was pretty awesome. Read further to see more details on my experience with P90X. If you work out for three months you’re going to see results but I think the benefit of P90X was the variety and constant change ups. Just as I was getting used to a weight work out the phase changed and I was on a different routine. No push up was ever similar and I was amazed how difficult a push up could become if you changed hand positions or adjusted something else. I kept a journal of how I felt each day and it is a lot of “tired” and “bagged” but there are signs of improvements from week to week, and this was evident in the numbers I posted with my weights and reps performed, especially on the pull up bar. I started being able to do a maximum six reps of a Wide Grip Pull Up, or Chin Up and now routinely do three times that while still doing the other exercises that morning. I also did the glamorous before and after photos, although I feel my after photo was impacted by a few items. Near the final weeks of my P90X I suffered a bad sinus infection and it kept me out of exercising for a week. This interrupted my weight regime and lead to me losing some tone. I feel that I eat pretty healthy already so I didn’t change what we were eating but I did become a little more conscience of portions. However, with Christmas time came treats and heavy meals so I cheated more than I would have otherwise. All in all I feel an improvement in my body over the last three months and a lot of that goes to P90X. I thought the only way to get in shape was to push heavy weight, but I haven’t used my bench press bar in months and I feel stronger for it. I think the real benefits will come into sports like hockey and skiing. I had good endurance but never focused on jump training or working muscles that fatigue quickly, but over the last three months I’m sure there will be improvements all around. 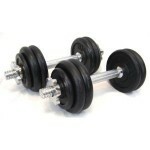 For those considering P90X I would recommend having versatility in weights. Have multiple weight options easily available. Changing weights on a dumbbell isn’t feasible when you go from one routine to another quickly. Some routines I would do 15 reps and others I would do 8. I would like to be consistent on this and aim for 8-10 reps per routine, and to do this I need versatility in the weights. At the beginning of the program my flexibility was a problem. I thought by naturally doing three months of P90X I would suddenly get flexible and able to do huge stretches but that wasn’t the case. I did the X-Stretch routine a few times but I usually opted for a rest on Sunday’s instead of stretching. I also would swap Yoga-X for Cardio-X, which probably didn’t do me any favors in improving my stretching. Be realistic in what you are capable of and I imagine if I did X-Stretch and Yoga-X weekly my results would be different but not doing a 90 minute Yoga exercise in the morning and working out every day for 90 days is a small price to pay for being a little less flexible than what I thought I would be at the end. Most importantly, stick with it. Some days are harder than others, some exercises are painful. You’ll cringe when you hear “One Leg Wall Squat” or “Corn Cob Pull Ups” but it’s all about challenging yourself and switching up the exercise routine and pain from a hard workout goes away eventually. My final day of P90X was right before Christmas, so I will take a few days off from morning work outs, but still fit in some Cardio, Core Synergistics or Plyometric routines in to burn off the heavy meals and then get back into the routine just as the calendar changes from 2012 to 2013. On the recommendation of the same P90X friend I will be moving onto P90X+, and if that goes well for me I will move onto P90X2. In the words of Tony Horton: Bring it! Good job Sean! This is a really thorough review of a popular program… I find it interesting that your posture is better in the “after” photos. Thanks Jaymie, it’s a difficult workout but rewarding. And somehow, two weeks into P90X+ they were able to make it even more challenging. Interesting observation on the posture. That may have been unintentional as I took more photos of the “after” and had the advantage of picking some of the better ones. There were several rounds with the self timer on the camera for the “after” ones but the “before” photos were taken quickly. However, there are a lot of back exercises so I could see posture being affected. We’ll see what the posture looks like in the “after” photos following P90X+.